MONTREAL -- There are a lot of empty pews in the Anglican Diocese of Quebec's churches, but the treasury is fuller than it has been in years. As shrewd investing is replacing weekly parishioner offerings as a main revenue source, the diocese is looking to ethical investment to build its portfolio in a socially responsible way that better reflects its values. In December, the diocese completed the process of selling off its $1.72 million in fossil fuel investments and the $525,000 it had invested in gold and copper mining. In doing so, it added its name to the growing list of organizations that have chosen to divest from oil and gas over climate change concerns. Bishop Dennis Drainville says the next step for the Quebec Anglicans is an investing shift to renewable energy. "It's not just an issue of taking money out and divesting, its also a question of using our money in a way that will help us to build a better world," he told The Canadian Press. The origins of so-called "ethical" investing among churches date back to the 1970s, when many opted against investing in companies with questionable human rights records or those dealing with guns, tobacco, or gambling. These days, faith-based organizations like Drainville's are looking even more closely at investment choices. Drainville said the church decided to pull its money out of the mining sector about four years ago over concerns of environmental degradation and poor working conditions on Canadian-owned mining sites in the developing world. A couple of years later, they decided to join the fossil fuel divestment movement. They aren't alone. The United Church of Canada voted in August to divest the $5.9 million it had invested in the large "Carbon 200" companies, and completed the process at the end of 2015, according to chief financial officer Erik Mathiesen. "This was not an investment decision but rather a church decision intended to bring attention to the issue of climate justice in solidarity with other faith communities around the world," he wrote in an email. Mathiesen said the church has also signed a United Nations pact for responsible investing and the Montreal Carbon pledge, which both commit to measuring and reducing carbon intensity. 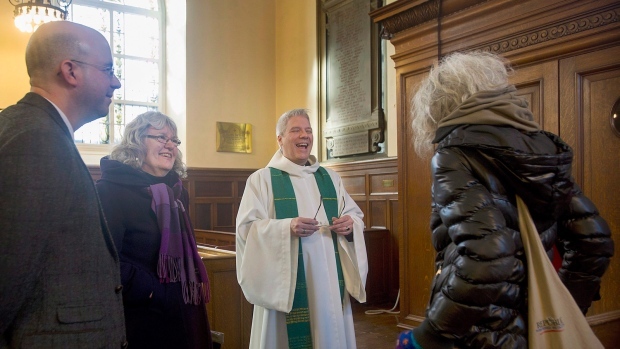 The Anglican dioceses of Ottawa and Montreal have also voted to end their own fossil fuel investments, as have several Unitarian churches, and other faith-based organizations. As church congregations dwindle, Drainville's diocese is depending on its portfolio to not only build a better world, but also to save it from extinction. Drainville says the diocese decided to begin closing churches, selling off properties and reinvesting the proceeds about eight years ago at a time it was "hemorrhaging money" and losing hundreds of thousands of dollars a year. While by no means on safe financial footing, there is reason for optimism a decade later. The diocese's treasurer said in a November report to the governing body that while cash flow and debt problems remain, the church's pooled funds have grown from $8.6 million in 2008 to $17 million last year. The diocese hopes to break even by 2017, an impressive feat given dwindling numbers in the pews. In 2014, Drainville's territory -- an area including Quebec City, Trois-Rivieres and Sherbrooke -- had only about 4,000 active parishioners, with 80 per cent boasting a regular attendance of less than 25 people. Drainville chalks it up largely to shifting demographics: the church's traditional base of English-speakers now make up less than five per cent of the population in many of those towns. Without investments, Drainville says the Diocese of Quebec, founded in 1793, would have disappeared. "I see the church as a community of people who care deeply about how we live and how we share our resources with people, and investments have to be a part of all those considerations," he said.